New Yorker Nina Runsdorf can be credited as a pioneer in the jewelry industry for her 'Flip' ring and use of huge gem slices to create unique statement pieces. A long time jewelry lover and designer, Runsdorf's eponymous collection is a red carpet favorite. Also, our favorite, because what's an Oscar night celebrity appearance without reaching the little people? We were delighted to visit her little 'slice' (get it?) of heaven in NYC's midtown and may or may not be straining at the leash for an invite back to play with jewels we don't deserve. Call us! I cherish understated luxury, integrity in quality, the way it makes you feel when you wear it, drive it and live it. I’m a creature of habit; I love the pasta at Sant Ambroeus. Buccellati Cuff, the design and jeweling is unique and unsurpassed. I’m happily taken. But the ideal first date should involve lots of conversation. I haven’t been to the movies in ages. 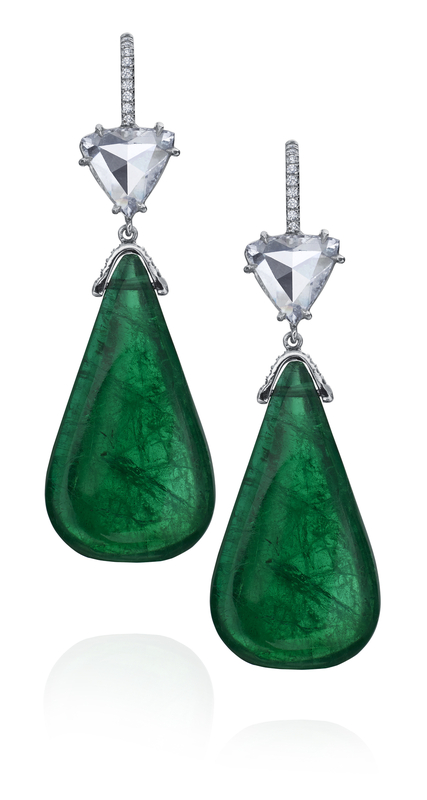 This past year my collection is about rare emeralds, I treasure a pair of 66.61 carats emerald bead and rose cut earrings with a matching emerald and rose cut pendant. A power walk around the reservoir in Central Park. A sterling silver vintage Hermes bracelet. An old family friend Richard Prince, we could reminisce about the past. My Flip Ring ™ it was the design that started my company 10 years ago. Mountains, it encompasses activities I adore. Nina's collection available online at Meridian Jewelers, as well at The Editorialist, Moda Operandi, and Neiman Marcus.